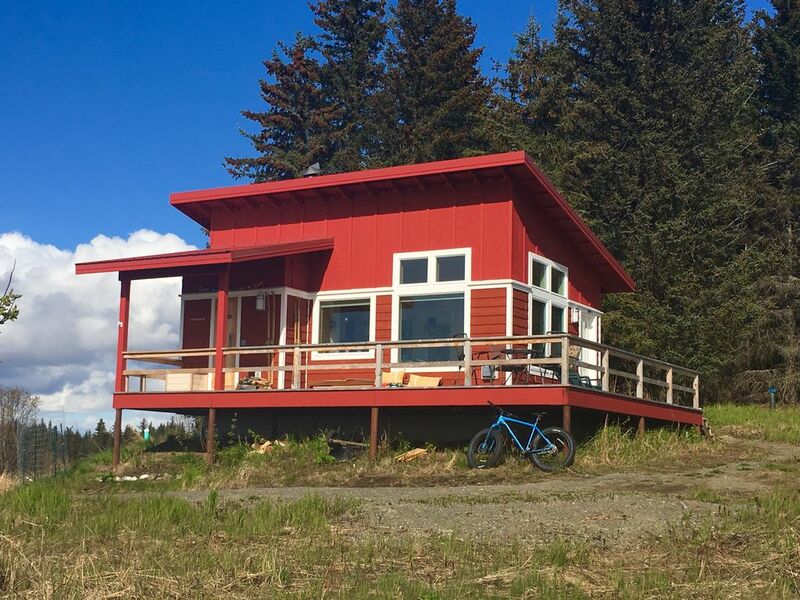 New, beautiful, Scandinavian-influenced, cozy, 360 sq ft one-room cabin --"a "tiny house"-- is modern, with all of the amenities needed for your perfect weekend getaway or week-long stay in Homer. Located next to the owners' house, tucked away from the road, on an acre and a half in a subdivision overlooking Homer, the views are fabulous of Kachemak Bay, Cook Inlet, and the volcanoes. Few places in Homer have views of both Kachemak Bay and Cook Inlet. Hardwood floors and Jøtul "wood" (gas) stove give the cabin a warm and cozy feeling. Majestic large windows bring the views into the cabin. The cabin is consistent with the "tiny house" concept, providing everything you need efficiently in a small space. Beautifully decorated with a modern, Scandinavian design. The one-room cabin sleeps two in a queen-sized bed. The luxurious cotton sheets, down pillows and comforter make this bed truly comfortable. Ask about the possibility for extra guests. We have a Pack-and-Play for your baby or toddler, a twin blow-up mattress, and two thick foam twin mattresses. An extra fee of $20 per stay per person is charged for more than two people. The kitchen is fully-equipped with a two-burner stove, a small refrigerator, microwave, and counter-top oven. All of the pots, pans, dishes, and utensils you need are provided. There is no dishwasher. There is a full bathroom with shower, sink, and toilet. The dining room table seats six people comfortably. The cabin is located a 2 minute walk from a sandhill crane nesting area. From May into September, sandhill cranes can be seen overhead, walking along the street, or strolling through our property. Moose are regularly seen year-round walking though the property or in the neighborhood as well as eagles perched in the trees by the cabin. A walk on the streets in the neighborhood and an undeveloped subdivision offers majestic views of Kachemak Bay. When you are ready to walk the beach, go out to eat, get some groceries, or explore Homer, it is only an eight-minute drive into Homer and another ten minutes to the Homer Spit and Harbor for fishing, kayaking, and boating. We have fast wifi and good cellular coverage in the cabin. There is no TV. Take your breakfast or dinner outside on the deck to enjoy the spectacular views and at some times of the year fantastic sunsets over Cook Inlet with views of the volcanoes. Love an authentic Finnish sauna? For those guests desiring a sauna, we have a traditional Finnish wood-burning sauna. For an extra fee of $35 your hosts will warm the sauna up for you with 24-hour notice. Coffee and teas are provided for your convenience. Have a boat or RV? No problem -- there is ample parking space for a smaller RV. Please ask for prior approval. Pets are no longer allowed. For more information about the area, we have a website: www.sandhillcranecabin.com. Check it out! We are also quite happy to help you with recommendations for fishing charters, kayaking trips, boat trips, restaurants, hiking trails, etc. Charlie moved to Alaska in 1963 and Helen came in 1981 (after growing up in Florida and living in Finland and the Midwest). They met at the University of Wisconsin in Madison. They lived in Anchorage for 35 years, but have recently built a new home next to the Sandhill Crane Cabin. Charlie has been everywhere in the wilds of Alaska when he was a hard-rock exploration geologist and Helen has been to many rural villages all over the state as a cultural anthropologist. Charlie currently works as a GIS manager for an engineering firm and Helen is retired from the U.S. Fish and Wildlife Service. They have two grown daughters living in Norway and Anchorage. Charlie and Helen enjoy exploring and enjoying the Alaskan outdoors, skiing, hiking, biking, camping, kayaking, or just enjoying a walk on the beach. Charlie particularly enjoys nordic, alpine, and back-country skiing. They also love Scandinavia and Scandinavian design, which has influenced their taste in the cabin. Helen was an AFS Intercultural Programs foreign exchange student to Finland, as well as a Fulbright Scholar at the University of Helsinki--which was the beginning of her love of anything Scandinavian. Charlie traveled extensively in southern Sweden and they met in a Scandinavian history class. Helen and Charlie have always loved visiting Homer and, after owning a home for 32 years on the hillside above Anchorage, they decided to move to Homer. Homer has always been a place for them where, the minute they arrive, they feel a calmness of spirit and relaxation. Homer also appealed to them because of the stunning beauty and the amazingly friendly people who live here. Thus, they decided to eventually retire in Homer. After searching for an ideal lot with a view, Charlie found this lot with an unusual view of both Kachemak Bay and Cook Inlet. The cabin was the first phase of their building. They wanted a place to have family and friends visit, but not have a huge house-- thus the idea of a guest house was born. In 2017 they moved into their new home next to the cabin. The thing we love most about the cabin is the view. It also is a beautiful, lovely cabin only minutes away from downtown Homer. The cabin is beautifully decorated and well constructed. We love it that we are close to Homer, yet we often see wildlife on a daily basis. toilet, shower, Shower, sink, and toilet. Hairdryer provided. Our cabin is on a few miles from numerous beaches as well as the Homer Harbor wth world class halibut and salmon fishing, kayaking, and boating. Views of Kachemak Bay includes amazing vistas of mountains and glaciers. Incredible views of Kachemak Bay and Cook Inlet. Gas fired wood-looking Jotul stove. Spices, cooking and baking items. The wooden, hand crafted dining table seats six comfortably. Wrap-around deck with table and chairs for four and two Adirondack chairs. The cabin is truly fully equipped for cooking. Need something? Ask Helen or Charlie. We are happy to lend more spices, condiments, or dishes if you need something other than what is provided. My husband and I booked this cabin for a bike race / anniversary weekend. Very rarely does a place exceed my expectations and the pictures match EXACTLY the condition of the property. This place does both. It is like a small house and it is charming. It is also efficient, clean, and quiet. We couldn't have possibly enjoyed our stay more. The attention to detail was marvelous. There was a sign that told you what you needed to know right when you needed to know it. The local Homer / Alaska art around the place was very complimentary. I would absolutely recommend staying here and would absolutely stay here again. Helen and Charlie were the greatest hosts! Helen's attention to every little detail made the difference. The cabin was tastefully appointed with lots of scandinavian decor and everything you need for preparing meals (pots, pans, spices, etc). And Helen keeps the property clean as a pin! BTW - the Alaskan Coffee supplied in the cabin was awesome too. Then there are the views of Cooks Inlet and the mountains - breath taking! We had the good fortune to be there during unbelievable September weather and used the deck quite a bit. We would definitely recommend this property for couples or small families. We would also stay here again! Thank you, Neal and Sandy, for the kind review. People like you and Sandy are the reasons we continue in this business--we love meeting people like you and sharing stories. Please come again! And, we will hope for some more awesome weather!! Helen and Charlie have created a beautiful, restful, comfortable slice of heaven for renters. The view is spectacular and the cabin is carefully thought out from the décor to the supplies in the kitchen and bath. To top it off, Helen and Charlie are very helpful in providing lots of printed material and advice on how to see Homer according to your favorite activities. On their advice we took a water taxi over the Bay to hike to the Grewingk Glacier Lake and then the next day hiked down Diamond Gulch to the beach. It was lovely! Our last stop in Alaska and easily our best. The cabin was so comfortable. We came from 108° desert heat and the cool foggy rainy days were just what we needed. Hosts provided lots of helpful info. Can't thank them enough for making this special place available to visitors. You were awesome guests, Wanda! We loved having you and loved your coffee. Thank you! We enjoyed the cabin greatly. It was very quiet and peaceful, cabin with a great view on your way to Homer. Helen and Charlie know the area well, and offered great suggestions for our meals. My partner and I stayed in the Cabin for a few nights and had an amazing time. Not only was Homer a delightful place to visit, but the location of the cabin made for easy access to everywhere we wanted to go. The binder offered inside with tips and guidebooks was also very handy. Helen's decor was fantastic - and we enjoyed seeing similar pieces by local artists in the surrounding shops. The bed was comfortable, the cabin was clean, and the views were spectacular. The kitchen also had everything we needed to make a nice dinner the one night we chose to stay in. This was a wonderful home and, after some of our other stays, felt like living in luxury to us. As my partner said, we felt as though were living some HGTV-Tiny-Home- dreams! If coming again to Homer, we would definitely stay here once more. The area surrounding Homer truly is one of the most beautiful places in Alaska and well worth the trip from Anchorage, Seward, or Kenai/Soldotna. This incredible area is filled with mountains, glaciers, Kachemak Bay, and amazing views of volcanoes. The town offers excellent restaurants, cafes, art galleries, and a museum. Homer is known not only for its outdoor activities, but for its art and many galleries. The Homer Spit offers all kinds of great activites--world-class halibut and salmon fishing, kayaking, whale watching, wildlife and bird viewing, charter boats, and boat tours. With the long daylight hours in the summer, there is plenty of time to do everything you want to do! A minimum of two nights stay required. There is only one queen-sized bed for two people. There is no separate bedroom -- this is a "tiny house" concept with everything in one room. A Pack-n-play is available for babies and toddlers. A blow up twin mattress or a foam pad are available for additional guests. Pets are no longer allowed. Smoking is not allowed in the cabin or on the property grounds.